I'm a member of the library in three different counties. One where I used to live (two years ago), one where I used to work (more than three years ago), and one where I currently live. Obviously I don't often visit the other two, but every once in awhile, I'll go back and visit where I used to work because I'll sometimes visit N and we'll have lunch together. As part of my Doing Something Different, I was able to do just that. And I was also able to check out a load of books that my own local library doesn't have. 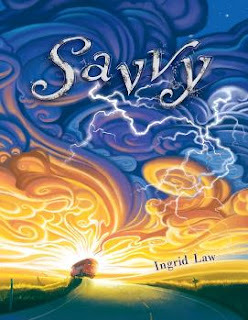 One of them being Savvy by Ingrid Law. It's no contest which is the nicer of the two. That American cover screams to be picked up, it's so pretty and magical, while the British version is so ho-hum in comparison. If I hadn't already read some great reviews of this book I would have never picked up this book. Not with the cover it has. Is that really shallow? I don't really care if it is. I think good cover art is important. Which book would you have picked up based on the cover? 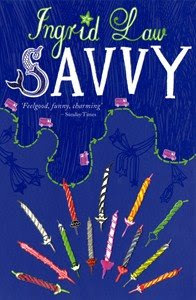 You know, though I do prefer the American cover of Savvy, the UK one would catch my eye as well. 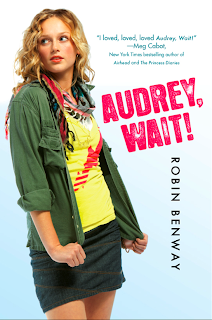 As for Audrey, Wait!, British cover hands down! I prefer the American cover for both books. With Savvy, the sky is cool, but it's the bus driving into the distance that intrigues me. And with Audrey, Wait!, I just like her outfit, although the British cover catches my eye, too. With Savvy: British cover, although from a critical standpoint, I think it has too much going on. But I'm intrigued by the assembly of birthday candles. With Audrey: British cover again. Very cool. You're even cooler to belong to 3 different libraries! I usually prefer the British covers over the U.S. ones. But you're right about Savvy. Neither "Audrey" cover does anything for me. That Savvy cover is magical. I would be very tempted to pick it up. The second book, I would not pick up at all, either cover. Happy reading today! I prefer the British one for 'Audrey'... there are things I like about both of the 'Savvy' ones. In both cases, they look like completely different books aimed at different readerships. Although I am torn by the Savvy covers, I think I'd give the slight edge to the British version. 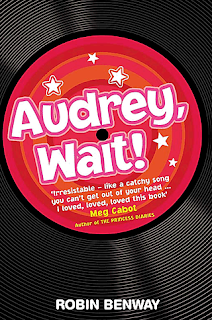 As for the Audrey books, hands down the British cover wins! None of the covers captured my fancy, but I do think that the American cover looks dated already. That outfit looks so 1990. If that is the setting for the book, then I guess that's OK.
For thaqt second book I'd choose the second cover. I like the UK cover for Audrey because I don't usually care for photographs of real people on fiction books. But I like the UK version of Savvy too, because I like the little stringy map with the pink cars and I love the pretty font of her name and mermaid "S." The American cover is too angry looking for me -- it reminds me of The Scream -- one of my least-favorite paintings. I really like the UK cover, I don't I would have read the American one. Have you seen the American covers for Sabriel etc they are terrible I'd never have bought those! And I just finished Audrey, Wait! I couldn't believe that somebody else out there read both of them too. Mine was of course also a US cover but a very different one - much more compelling to me, with a real person but all different colors around her. I guess it's the hardcover, and the one pictured in this post was the paperback. I liked Audrey, Wait! a lot more; I expected something with the sort of breezy, quickly-written feel of a lot of chick lit (including teen chick lit), but it was very well-written. Everyone talked and acted like real people, and there were lots of great details in the story and the language. I am dying to know what you thought of both books! I would have picked up the 2nd book as I love all things retro.